Based on a bi-directional link, you can synchronise an item between Insight and Petrel. For a remote item that is linked between Petrel and Insight, you can synchronise the item to ensure that changes that have been made to the item in either Petrel or Insight will be updated in the other. This can be done when Petrel and Insight are connected. From Insight, right-click the item. If the item was modified in Petrel, this will update Insight's copy of the item. If the item was changed in Insight, this will update Petrel's version of the item. Note: If the item was changed in both Insight AND Petrel, the Conflict Resolution window will appear to give you the option to keep either the Insight version, Petrel version or both. If you choose to keep both, it will unlink the Insight item from the Petrel item and create a new version of each in both Petrel and Insight (the Insight-modified version and the Petrel-modified version) respectively. The item modified in Petrel will retain its name, while the item that was modified in Insight will be renamed to "[Item name] [current date/time]" (i.e. Well 2 2014-01-15 09:25:10) and copied to Petrel. 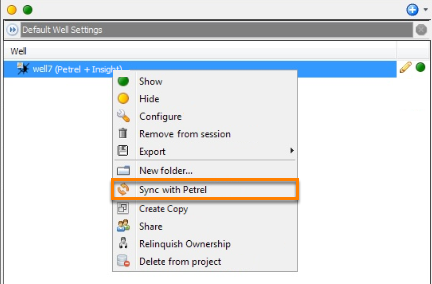 You can synchronise an item created in Insight to Petrel. This can be done when Petrel and Insight are connected. You may want to do this once you have edited an item which was created locally for the purpose of using it in Petrel. 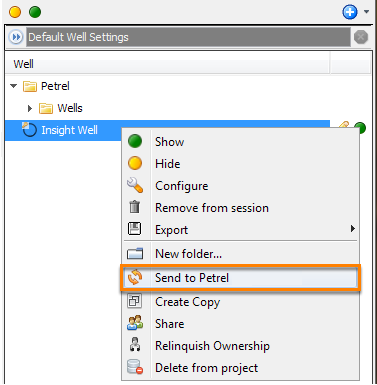 Alternatively, you may also want to use this feature when you create a new item in Insight and wish to make a copy of it in Petrel. The creation of the item will also be displayed in Petrel's message log. The text "(Petrel + Insight)" will appear beside the item name in Insight. 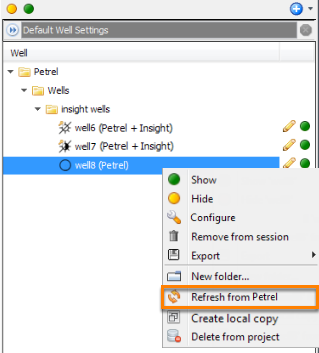 For a remote item without a local Insight copy, you can refresh the item to ensure that changes that have been made to the item in Petrel will be updated in Insight. Click Refresh from Petrel. All changes that have been made to this item in Petrel will be updated in Insight.